Bessie was a pig-headed cow! Bessie loved the neighbor’s petunias and would do anything to get to them. We strung a barbed wire fence to contain her. Bessie got down on her knees and crawled under the lowest strand to free herself. She would sashay (udder swinging to and fro) down the tractor made two track from our barn yard, cut across our back yard, duck under the neighbor’s picture window overlooking the lake, and graze on those fragrant petunias. Mrs. Coffeen, our neighbor, painstakingly planted petunias around her house every year. With broom in hand, Mrs. Coffeen chased the dogs from “oiling” the flowers, she set traps for the chipmunks so they wouldn't dig their caverns in her flowerbeds, she even went so far as to set out a plastic owl to keep the birds and the squirrels away from her precious petunias. So, when Bessie made up her mind they were her most favorite treat, Mrs. Coffeen took much offense! No amount of finger-pointing at the local deer making their hoof prints would soften her fury. If it wasn't for her tell tale hoof prints, no one would even know she was the culprit. 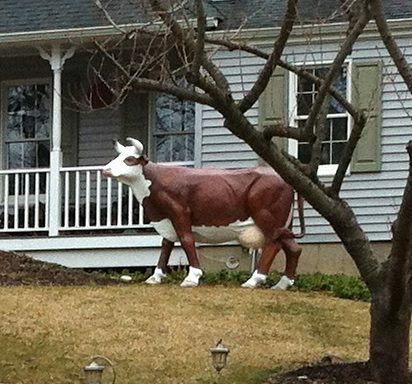 She would graze all around the Coffeen’s house, until she hit the low windows. Then she would strike out for the lake. Bessie, a Guernsey cow, loved us. We were her people. She was as smart a cow as I ever did meet. Her soft brown hair accented those huge caring eyes. I’m pretty certain the term “cow eyes” came from some fella owning a Guernsey cow. If you have ever seen a milk-cow swimming, it’s enough to make you take up strong beverages! She would make two laps around the swim raft then head back up to the barnyard. If you missed her swimming, she would simply be waiting at the gate, ready to be fed her evening meal and to be milked. One morning, shortly after the morning milking, we heard our neighbor, Mrs. Coffeen, yelling at the top of her lungs. She was yelling so loudly we couldn't make out what she was saying. Scott, my brother, grabbed his shot gun, I grabbed the baseball bat, and we dashed out to help our poor neighbor who was obviously in mortal terror. It was Bessie, just cresting the hill to go for a quick dip after her lovely breakfast of pink petunias. For the sake of peace in the neighborhood, Bessie soon was living on someone else’s farm. Life became a little more quiet and a little less fun. lol loved this! And how you incorporated two prompts into one! The link back to the workshop isn't working?